Our homeschool curriculum choice has been Switched On Schoolhouse, by Alpha Omega Publications. AOP offers the same curriculum in an online format called "Monarch"; Switched On Schoolhouse is their disc-based version. We chose SOS instead of Monarch because it allows our students to do their work anywhere - in the car or a doctor's waiting room - regardless of the available Internet connection. SOS has two program interfaces, "student" and "teacher", and two installation modes, which they call "full" and "client". If you only have one computer, then you do a "full" install of both "student" and "teacher", and both the student's work and any grading are done all in the same place. However, that means that for me to do any grading, my students can't be using their computers, and I also have to do be seated at their computer rather than using my own, which isn't ideal for us. AOP has attempted to resolve this inconvenience with their "client" offering. The intended layout is a "full" installation on some host computer (probably the teacher's machine), and then a "client" installation of the student interface on each student's machine. This setup allows the teacher to see all students in the school within a single interface, switching between them with a simple dropdown menu. However, it also requires that the host computer be available on a local network to the students at all times, which would be even worse for us than the online requirement of Monarch (we'd have to set up a local network in the car, and I'd have to bring my computer when I would not normally). It's possible to reverse the installation: do a full install on the student's machine, and a client install on the teacher's. This layout allows the students to work from anywhere, and when we are on the same local network, I can access their machine from mine and do grading, even while they are using their computer for something else. For a single student, it's ideal, but there's one snag: we have multiple students, each with their own computer. During client installation, you must specify which machine is running the full installation, and there is nothing in the interface that allows you to easily change it later. So I can set it up to connect to Iona's computer, but then can't switch to grade Eden's work. However, all is not lost. The client stores the name of the computer to which it connects in a configuration file. Edit the file, change the name of the computer, restart, and you're now connected to the other student. As plain text, it can be edited with Notepad, Wordpad, vim, or any similar program. I usually avoid using Microsoft Word or similar word processors to edit config files, because they often try to modify the encoding, replace straight quotes with "pretty" quotes, and other similar things which make the program which is trying to read that file very unhappy. It's a protected file, which means the editor must be running with elevated privileges (right click, "Run as administrator"). Change IONA-LAPTOP to EDEN-LAPTOP, save the file, start up SOS, and now I can grade Eden's work instead. Editing a config file manually every time I want to switch students is tiresome, boring, and repetitive - exactly the kind of things computers do way better than humans. A script beckons. Since Windows doesn't have a nice regular expression replace program like sed built in, we'll need our own - that's what replace.vbs does. Then we'll need a batch file to call it with the correct parameters - that's what switch.bat does. 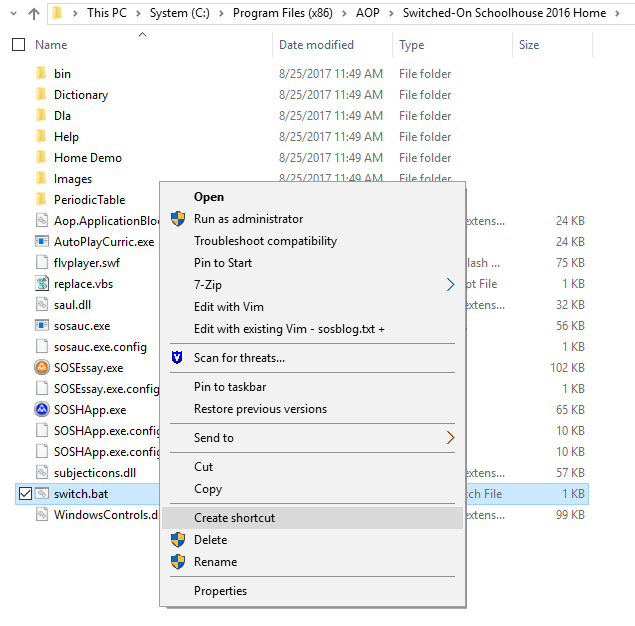 Extract these two files and put them in the C:\Program Files (x86)\AOP\Switched-On Schoolhouse 2016 Home\ directory (which you'll have to do as administrator). Now, for each student, right-click on switch.bat and choose "Create Shortcut". It will ask if it can create the shortcut on the desktop; that's fine. 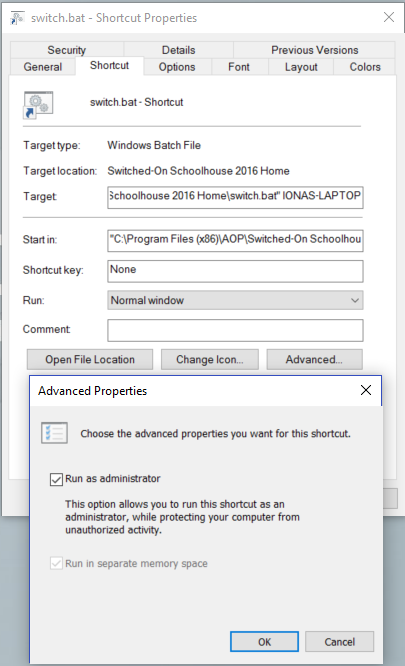 "C:\Program Files (x86)\AOP\Switched-On Schoolhouse 2016 Home\switch.bat"
Click "Advanced" and check "Run as administrator". You may also choose "Change Icon" - it will tell you that switch.bat doesn't contain any icons, and bring up a window with a bunch of standard Windows icons to choose from. To get the SOS icon, click on Browse..., navigate to C:\Program Files (x86)\AOP\Switched-On Schoolhouse 2016 Home, and open SOSHApp.exe. On the General tab, you can change the shortcut name. It's probably "switch.bat - Shortcut"; I changed it to "SOS Iona". Now, make sure that SOS is not running. Double click on one of the shortcuts. After a moment (and possibly a question if you want to let it change settings on your computer - choose Yes or OK), it should open SOS, and you'll find that you have access to one student's work. Close SOS, launch the other shortcut, and verify that you now have access to the other student's work. If there's a very long pause, and then an error message saying it can't connect, either you did not put the correct computer name in the shortcut target, or that computer is not running or has a firewall preventing access. The SOS installation disc 2 has some utilities to help you configure all that, and their FAQ and tech support can walk you through that bit. Eden (squeaky voice): You can't come in! Eden (deep voice): Why not? Eden (squeaky voice): Because you're a monster! Eden (deep voice): Oh. Ok.
Iona: Daddy, am I going to marry you when I get big? Daddy: No, you'll marry someone else, and the two of you will have your own family. Iona: (in tears) I don't want to leave! I want to stay with you and mommy! 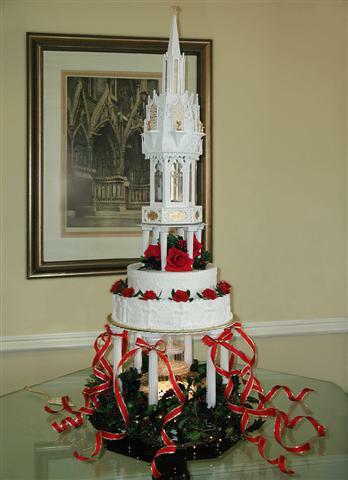 Iona: Daddy, what kind of cake did you and mommy have at your wedding? Daddy: I'll show you a picture when we get home. Iona: Daddy, I think it will be ok if I marry someone else and we have our own family. Iona: What are we watching? Iona: Are they on a boat? Daddy: No, they're in a POW camp. Iona: Oh. New York is sort of like Texas. We found a couple of tiny spiders in the door frame of the waiting room. Iona: "Why do they have spiders?" Daddy: "They keep them as pets, to catch flies." Iona: "They need to build a water spout so they can catch more flies." Daddy: "What do grapes grow on?" Daddy: "What do pears grow on?" Daddy: "What animal is famous for being in a pear tree in a song?" Iona: Bakin' a birthday cake! Iona: Now, laugh at me. What was that diagnosis again? Eden: "Iona had to go to the doctor because she had a rash." Daddy: "Yep, but the doctor said it wasn't chicken pox." Eden: "Yeah, but the doctor didn't say it wasn't popsicles. Or an apple, or a banana either." Iona: "Is it dried water or cold water?" Eden (standing on bathroom scale): "42 pounds! I can't believe it!"